Current dress uniforms of the USMC (source: USMC). As one views any iteration of the current Marine Corps uniform, it will be observed that they are somewhat simple in their design and appointments, paying homage to their traditions and legacy. While the present-day US Marine Corps uniforms may appear to be vastly different from those worn by colonial marines, they carry a significant amount of features and the overall theme from the originals. 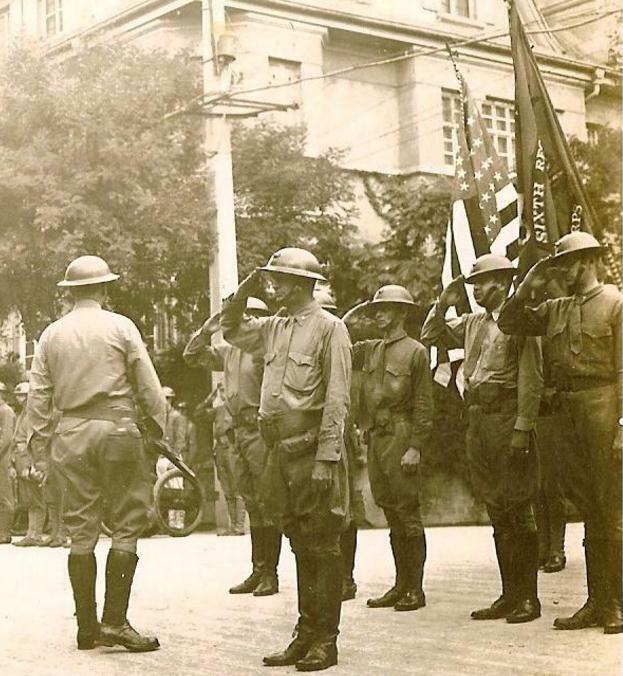 The WWI-vintage SSI of the 11th Marine Regiment of the 5th Marine Brigade (Source: Hayes Otoupalik). Here is a pristine example of a WWI Marine uniform with the 11th Marine Regiment, 5TH Marine Brigade patch. SSI of the 2nd Battalion 6th Marines (Source: Western Front Association). As war waged in Europe in the early twentieth century, the United States was virtually unprepared to take on any combat activities due to the isolationists’ vehement opposition to the seemingly continuous strife of the monarchies of the old countries. The unpreparedness of the US military became apparent as they began to train and outfit the troops. The leadership had to scramble to buy materials to produce the uniforms required to equip nearly 4 million troops. The Army had been in a period of transition from the uniform patterns used during the Spanish American War, and evolved through a handful of designs prior to arriving at three patterns used during WWI. 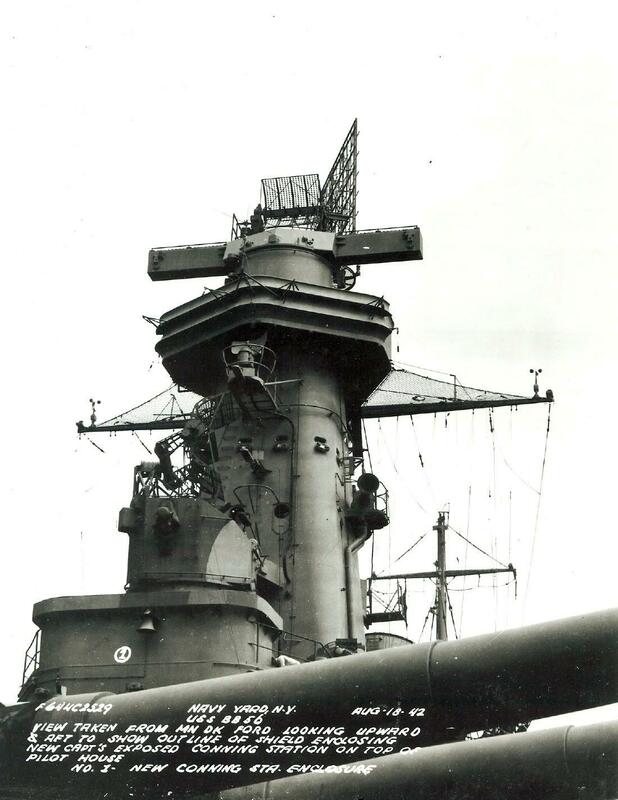 The Marines, having been even less prepared, had to rely on the the Army for outfitting, for a number of reasons that included unifying all of the Allied Expeditionary Forces (AEF) and the need to consolidate production due to time and resource constraints. 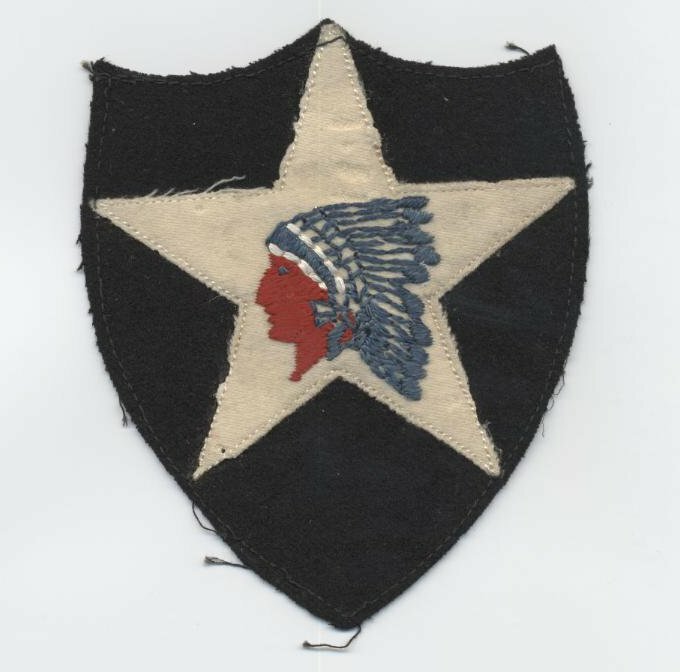 This shoulder patch belongs to the 6th Marine Regiment (Source: US Militaria Forum). As the AEF began landing in Europe, there was little distinction between the branches of U.S. forces, largely leaving them to all look indistinguishable from each other. The Marines, seeking to set their uniforms apart from those of the Army, began to appoint their jackets with buttons and collar discs while adding the eagle, globe and anchor devices to the overseas cap. Late in the war, the Marines began applying shoulder sleeve insignia to the left shoulders of their jacket sleeves. 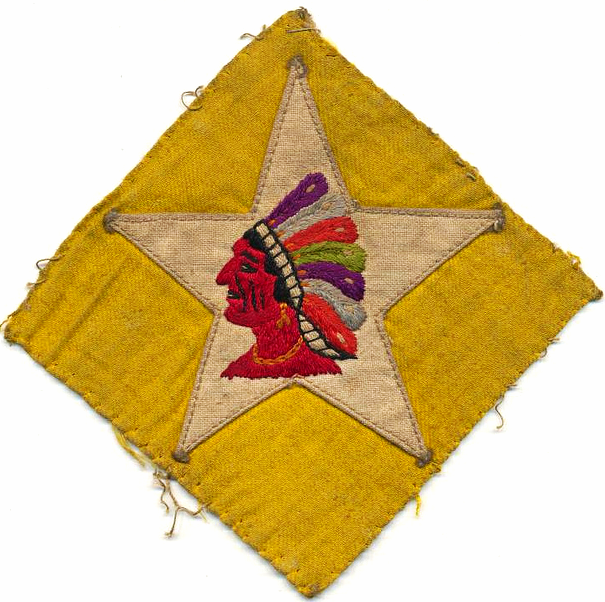 With the 6th Marine Regiment being placed under the Army’s 2nd Infantry Division, the design of the Marine SSI bears similarities to the 2ID patch, incorporating the Indian head symbol. The rarer USMC shoulder patch of WWI is that of the 11th Marine Regiment (part of the 5th Marine Brigade) which bears the Roman numeral “V” superimposed over a black EGA. In the years following WWI, the Marine Corps uniforms returned to their original configurations, removing the unit identifiers. You can clearly see that these interwar-period China Marines lack any SSI (Source: Chinamarine.org). Following combat on Guadalcanal, Marines of the 1st Marine Division were en route to Australia for R&R. It was thought that the Marines would again be wearing army uniforms, like they did during the Great War. Seeking to set the Marines apart from the army troops, discussion among the division leadership began taking place about a solution. “They sat in facing bucket seats, between the litter of packs, seabags, typewriters, briefcases — the kinds of things that staff officers would necessarily bring out of battle. They had been on the ride from Guadalcanal to Brisbane. Because the first few days in Australia were hectic, Twining did nothing else about the patch until one morning he was called into Vandegrift’s office. “Well, Twining, where’s your patch?” Vandegrift asked to the discomfort of Twining. These are the Marine Divisions (1-6). Shown are two versions of the 2nd MarDiv. Three of these patches are wool felt. Showing the patch fronts of four of the Fleet Marine Forces, Pacific; V Amphibious Corps (with the alligator); also displayed is the “Londonderry” patch of the ” Irish Marines’ of the 1st Provisional Marine Battalion. 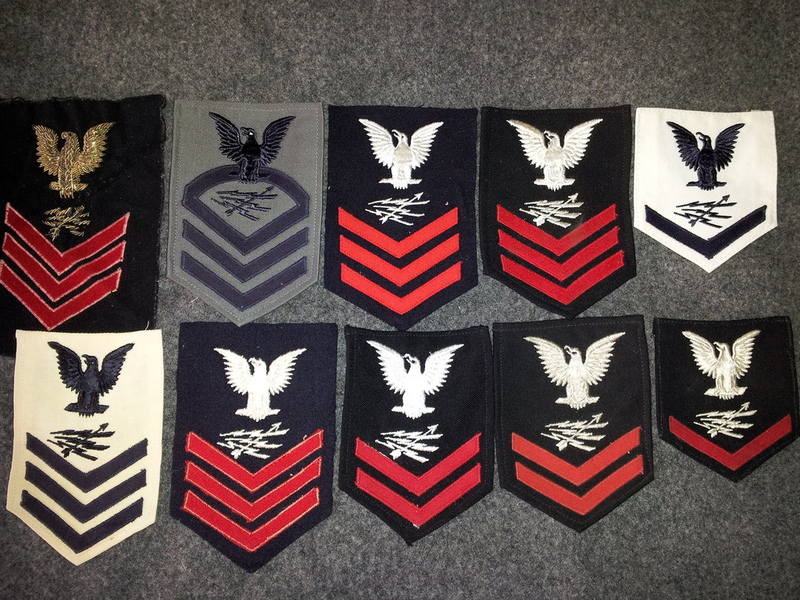 Marine Air Wing Patch variants. One of these is a felt patch. The backs of the patches can help shed light on whether they are authentic. Showing the backs of the FMF and other patches. 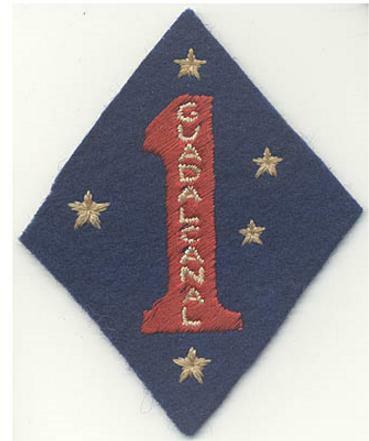 As the war wore on, other Marine Corps units began to design and implement shoulder sleeve insignia, sourcing from many manufacturers resulting in multiple patch variations for each unit identifier. In March of 1943, Marine Corps leadership made shoulder insignia officially supported, approving them for wear on dress uniforms. Shortly after the end of the war, the Marine Corps struggled to maintain their existence while their ranks contracted from six divisions and five air wings (and several ancillary battalions) down to three divisions and wings. 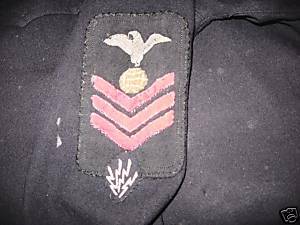 The need for the shoulder insignia had passed and so they were eliminated on January 1, 1948. No SSI has been (officially) worn on a Marine Corps uniform since that time. As with Army SSI, collecting each version of each unit patch can be a fun yet painfully lengthy process. As with any aspect of collecting, the rarer the patch, the larger the dent will be in your budget. In preparing to move into collecting USMC SSI, I recommend that you start off simple. Pursue the common patches while keeping your eyes open and setting aside funds for the rarities. It is advisable that you obtain trusted publications to learn how to distinguish between the variants and the faked patches. *McMillan, George. The Old Breed : A History of the First Marine Division in World War II. Washington: Zenger Pub. Co, 1979. In some instances, terms can be rather self-explanatory (at least for people like me), but still may not make a whole lot of sense. Such is the case with “theater-made”, which seems to be bandied about rather freely. To a veteran of the U.S. Navy, theater-made items seem commonplace. During our six month-long deployments to the Western Pacific, our ships would visit ports in countries such as the Philippines and Hong Kong. During our three- and four-day stays, many of us would take what little money we saved and head out to the tailor and embroidery shops to order custom uniforms or uniform items from the local craftsmen. These special-order pieces add a unique and personal touch for uniforms worn out on liberty or to make us stand out in a positive manner during inspection. However, we never thought of these components as theater-made. Aside from having items made for uniform-wear, armed forces personnel find unique methods for commemorating events, deployments and other aspects of their service. Having patches custom-made to wear on a utility or flight jacket (to document a deployment) was a common occurrence in the years that I served. 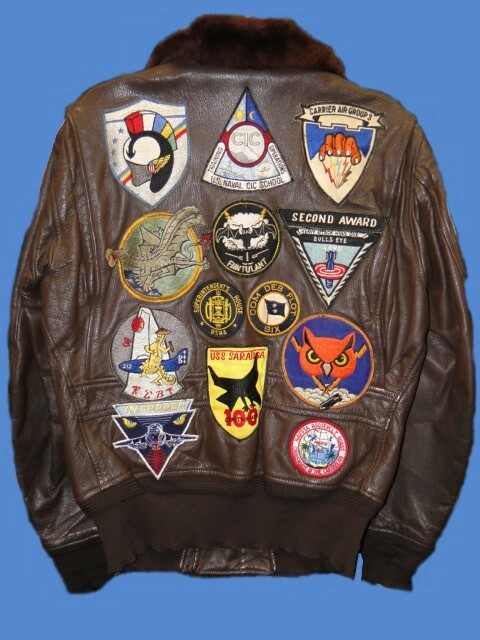 Patched naval aviator jackets were quite popular in the 1960s and again in the ’80s. Many aviation squadron detachments had patches custom-made to denote their deployment and the ship they were attached to. 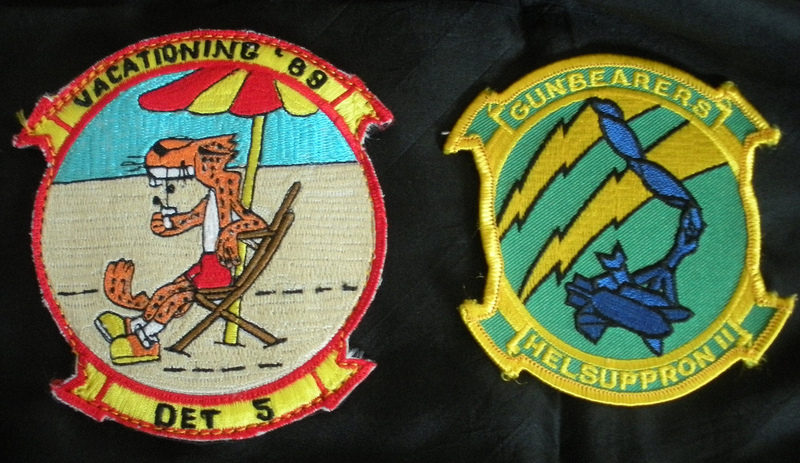 The patch on the right is the helicopter squadron’s official insignia while the patch on the left was custom-made in the Philippines for the specific deployment (in 1989) and detachment (Det. 5) from the unit. 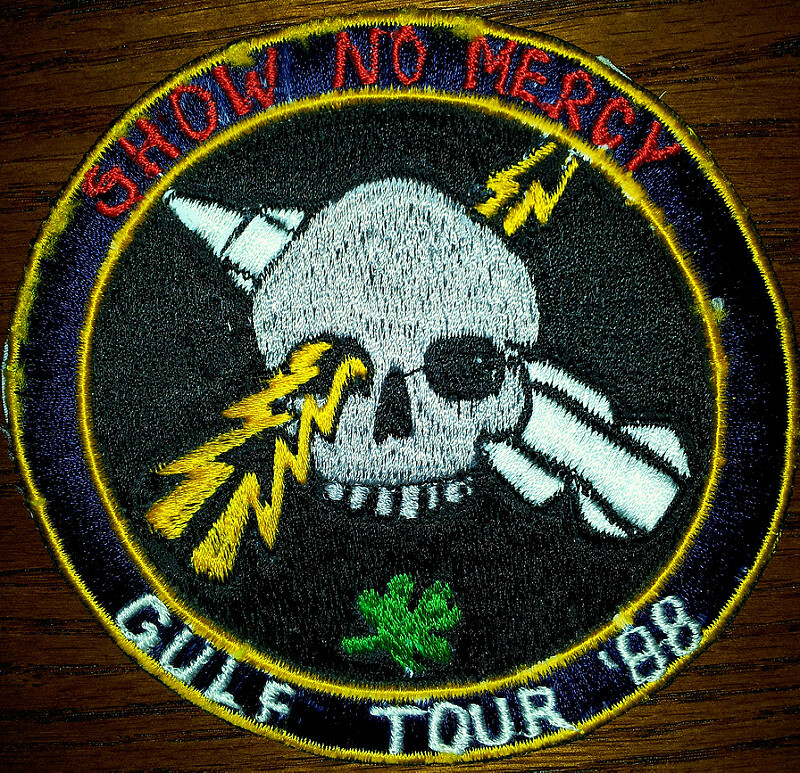 During one of my deployments, I had this patch made in the Philippines to commemorate our tour to the Persian Gulf. 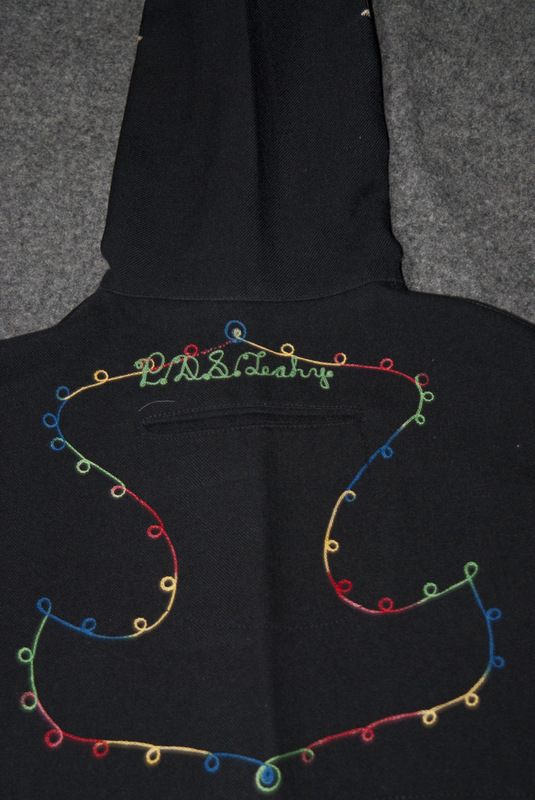 The embroidery was done with a machine that was free-hand (rather than computer-controlled) leaving a more rudimentary interpretation of my design. As some of the custom pieces are slightly more rudimentary in construction, forgers tend to leverage that to their advantage. When collectors begin to pursue what are being passed off as theater-made items, they must have some sort of education before pulling the trigger to protect themselves from being deceived. Learning how to discern the difference takes time in comparing known, genuine items against pieces that have far too many variances can be a lengthy educational process. One of the stumbling blocks that many inexperienced collectors do is to subordinate their judgement to that of experienced collectors, relegating their decision making to another person without allowing for knowledge transfer – not asking the questions in order to learn for themselves. I am still learning how to tell the difference with patches from earlier eras (WWI, WWII and Vietnam) and seeing that there are a lot of very well-executed fakes (sometimes branded as “reproductions”) that fall onto the market with little or no description and a fair amount of deceptive language leaving the potential buyer to make a judgement call. With some patches trading hands for prices for several hundred dollars, con-artists are quick to take cues from the collectors and attempt to replicate (with faux aging) vintage items to sell to unsuspecting collectors. 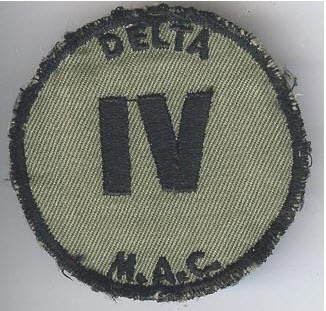 My father, a Viet Nam combat veteran, wore a patch like this on his OD fatigues in country. I have my doubts as to the authenticity of it as a vintage patch, instead it could be one of the thousands currently reproduced in Vietnam to capitalize on the growing collector market. One aspect of collecting militaria is the discovery that the item you’ve just purchased has a veteran’s name associated with it. Quite often, U.S. military-related pieces are marked with a soldier, airman, marine or sailor’s last name, initials and/or service number. In some cases, while not possessing a name, uniform items can have a laundry number inscribed in them. This information can provide the collector with a means of researching the veteran to determine where and when he or she served, as well as awards and decorations earned. In one of my earlier posts, I described how collectors should buy the item as opposed to buying the story. With these named items, we have the potential to provide the actual story to accompany the item in order to explain where the particular item may have been used or worn. At the very least, the piece’s original ownership can be established. For many collectors, the potential for owning an item that is named to a veteran who has significantly contributed to historically important military events or battles is akin to striking gold. 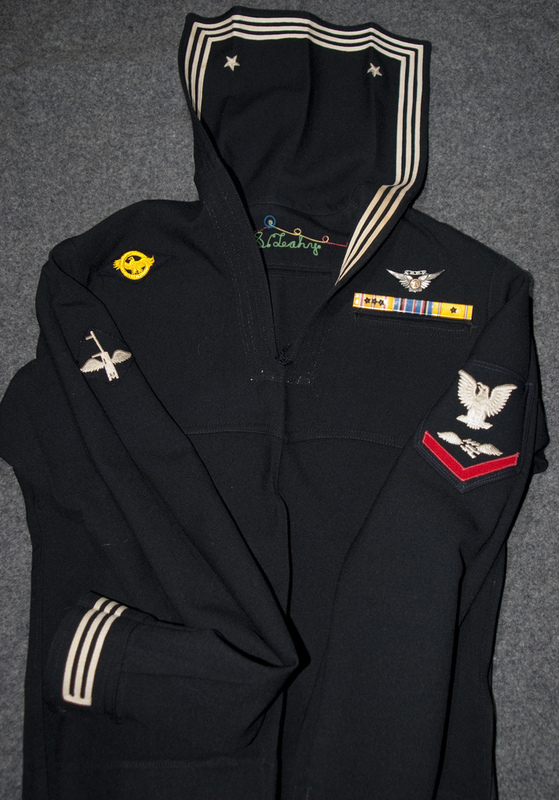 To discover that the uniform you just purchased was worn by a Valor Award recipient (Medal of Honor, Navy Cross, Distinguished Service Cross, etc.) is exciting and very rewarding as they are relatively rare. Proving with iron-clad documentation that the name stenciled into your uniform is THE person who you believe them to be can be a challenge. Researching a U.S. veteran can be difficult and time consuming, and you have to be committed to the end-goal if you are seeking definitive results. There can be considerable costs associated with research as well. These factors will lead many collectors to be content with an un-researched piece remaining in their collection. Before you can begin the research of the veteran’s name, you need to determine several basics about it. What period is this piece from? Look at the construction. Pay attention to the details. For WWII and earlier uniform pieces, determine what materials it was constructed from. Does the fabric or stitching glow during a black-light test? 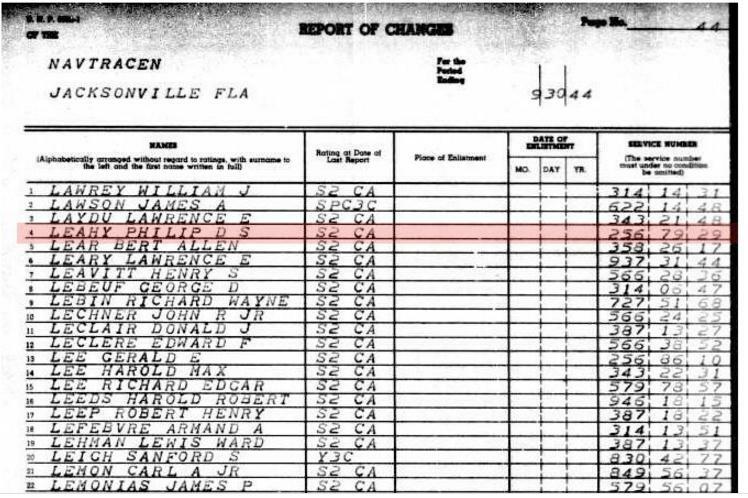 If you can determine the veracity of the item for the suspected time frame, you can move on to researching the veteran’s name with a measure of confidence. There are a few decent online research resources to conduct searches for your veteran’s name. Some sites, such as the National Archives (NARA), are free to use. However, they aren’t complete and just because the veteran’s name doesn’t appear in the results, it doesn’t mean that you’ve hit a dead end. Below are a few of the resources I use. If a veteran’s name is more unique, researching can become easier. Surnames such as Smith, Jones or Johnson can be extremely difficult to pinpoint with research. Having a service number to associate with the veteran can truly help solidify your results, although there have been instances where the service number cannot be located within NARA. This could be the result of the 1973 fire where 16-18 million records were destroyed. Slowly, the records are being restored and there is a chance that with time, your veteran’s records may be available. Two of my uniforms (that I have selected to demo in this post) are named. 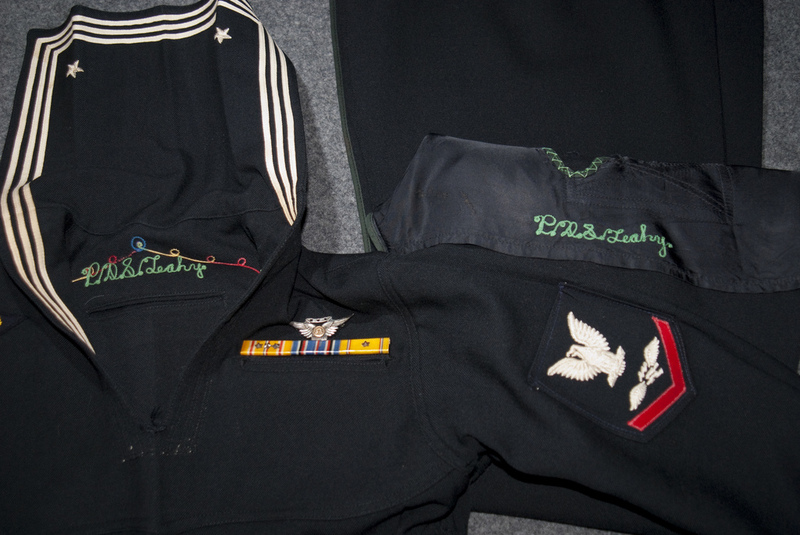 The first is a set of World War II dress blues for an Aviation Radioman 3/c that are tailor made (the sailor had them made especially for himself) with his name and initials embroidered into both the jumper top and the pants. The blues feature a side zipper and a very slim cut to make the uniform more form-fitting. Also in this tailored set are secret pockets to conceal money or identification from pickpockets or con artists. 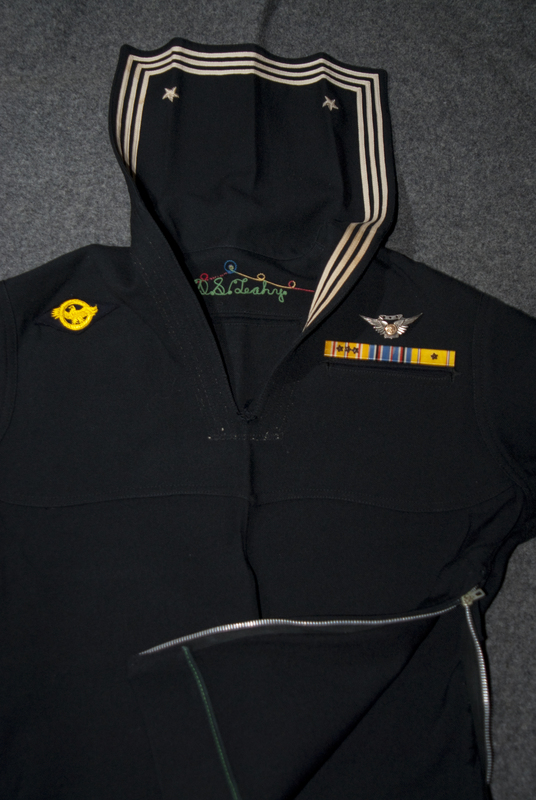 This jumper also features the aircraft gunner distinguishing mark and ruptured duck discharge patches (the ribbons and aircrew insignia pin were added by me for display purposes). The overall view: Leahy was a aerial gunner (the distinguishing mark on the right arm) and his rate was Aviation Radioman. Aviation Radioman 3/c P. Leahy uniform. This view clearly shows the custom-fitment of the zipper (to allow for a tighter fit while still affording the sailor to pull this on and off with relative ease. Also note the post-war ruptured duck on the right breast and the aircrew pin. The ribbons for this man show that he was a Pacific Theater sailor and spent time inside of an aircraft (as noted by his aircrew pin). 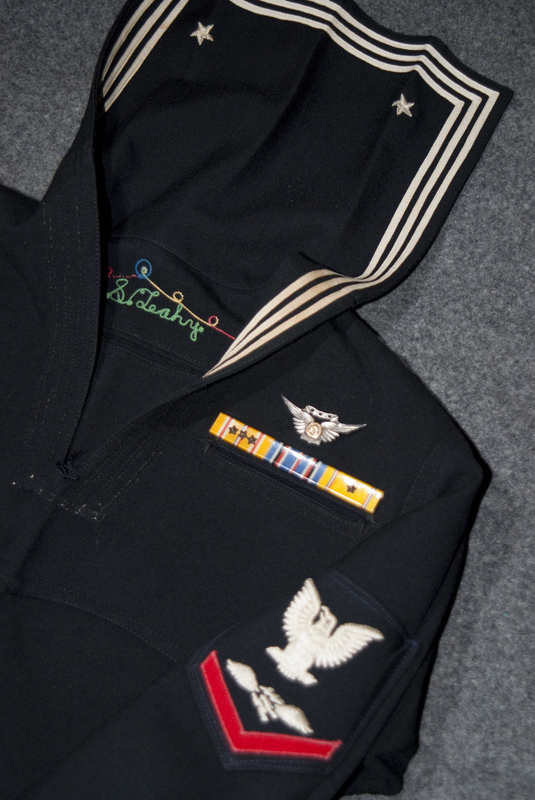 Custom or tailored uniforms are often adorned with flair such as this anchor-inspired, colorful embroidery. Aviation Radioman 3/c P.D.S. 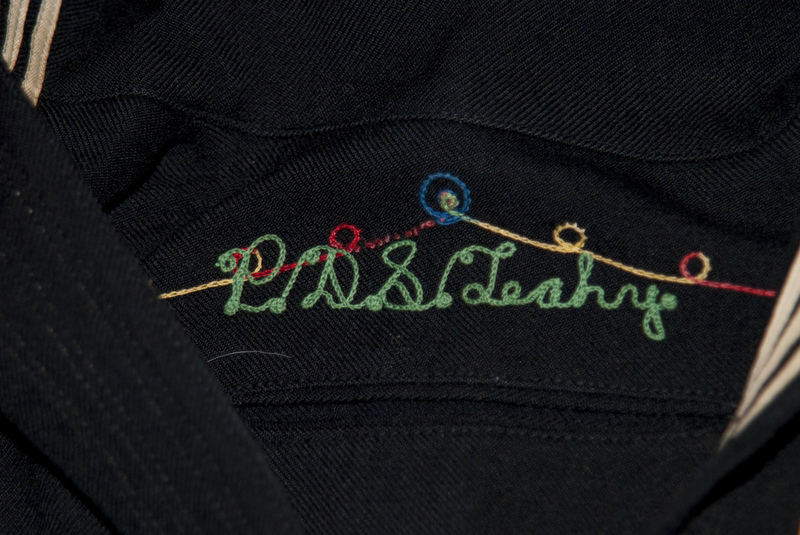 Leahy is embroidered into this custom tailored service dress blue uniform jumper. A search on Ancestry produced a single record that more than likely is the veteran that owned this uniform – the name Philip D. S. Leahy is very unique. 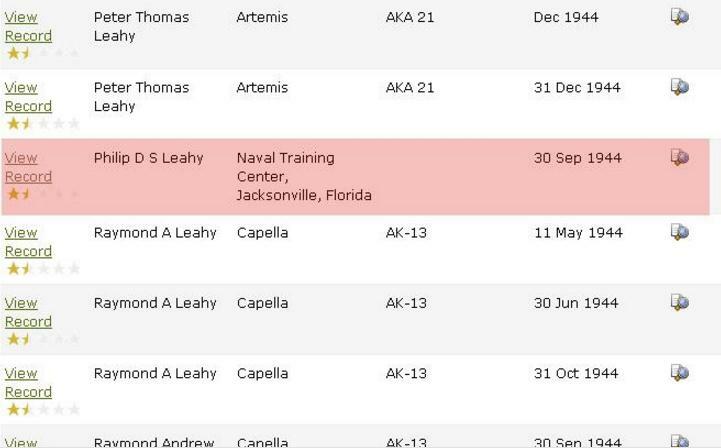 Unfortunately, there isn’t any more information which means that I will have to take this information and turn to other resources to find out more about this sailor. 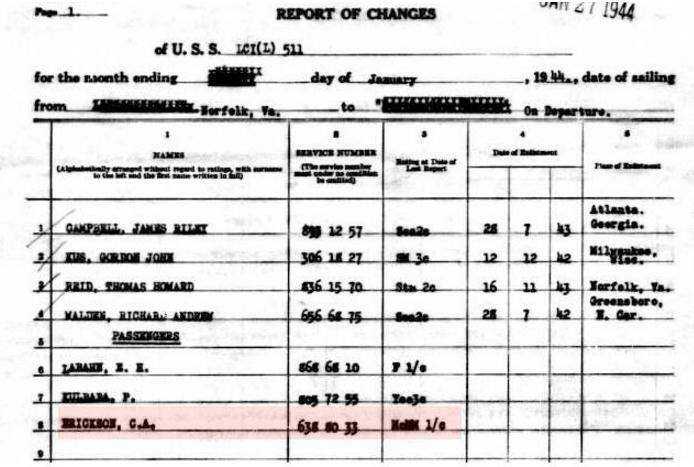 Ancestry Search – This muster sheet clearly shows Philip D S Leahy as a seaman second class being transferred from the Naval Training Center, Jacksonville, FL to the Naval Air Technical Training Command in Memphis, TN. 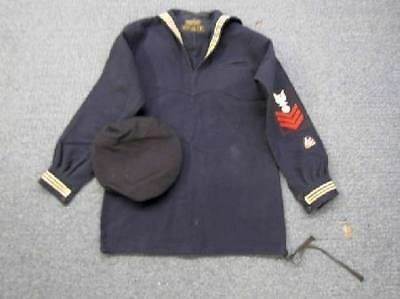 The next named WWII navy uniform, a Pharmacist’s Mate Second Class dress blue jumper, is named to a C. A. Erickson. My WWI-era Ship’s Cook, second class is stenciled with the name, “C. A. Erickson” inside and above the hem. Ship’s Cook/Baker, C. A. Erickson is clearly stenciled inside the dress blue uniform jumper. 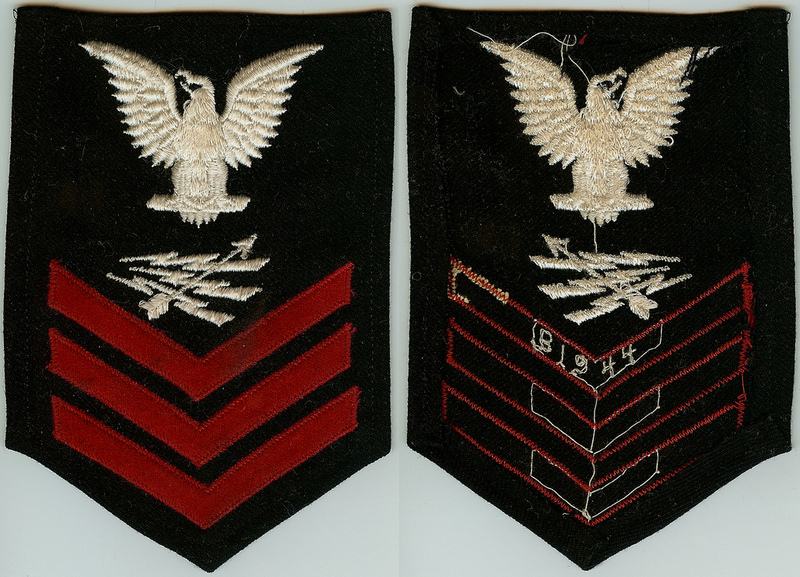 Three stripes on the cuff denote that this sailor advanced to seaman (and then onto petty officer second class). 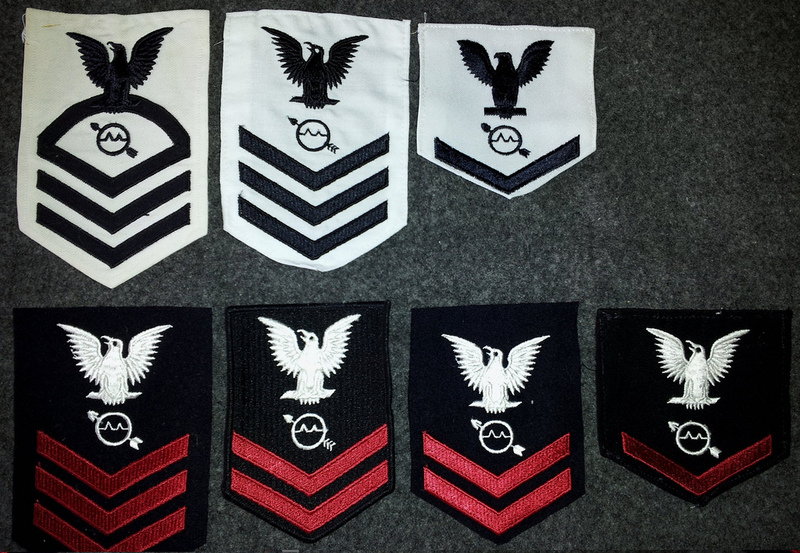 C. A. Erickson’s rating badge is trimmed like most of the sailors of the WWI era. The proper way to store a navy dress blue uniform is inside out and creased down the center. This gives the uniform a unique appearance and the flap lays with an intentional appearance with three equally distributed creases. Showing the underside of C. Erickson’s jumper flap. After an exhaustive search in the navy muster rolls, I have come up empty handed. While there are several names that match or come close, none align with this uniform. Ancestry Search – C.A. 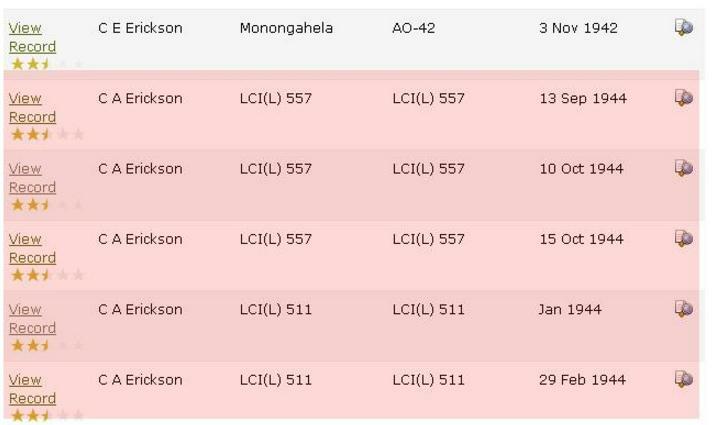 Erickson results – several records to choose from. Searching through Ancestry I found the C.A. Erickson results and there were several records to choose from. Again I will have to turn to other resources to see if I can find the name. I have less to go on than the first example. In a future post, I will tackle the next level of researching veterans and submitting FOIA requests.